Rory Lewis Photographer has made an outstanding contribution to photography and the visual arts, creating consistently imaginative and thought-provoking portraits. Rory’s ‘Northerners Exhibition’ is an entirely new collection of portraits from a cross section of Northern Celebrities, Sports Personalities, Actors, Politicians and people encountered. Featuring Sittings with Sir Ian McKellen, Sir Patrick Stewart, Ian McShane, Emma Rigby, Claire Sweeney and many others. 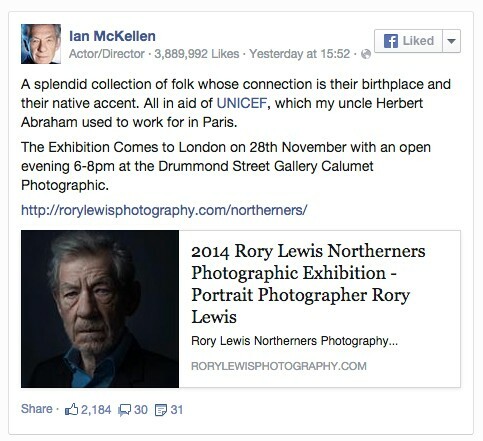 Rory hopes to Raise £1000 through the exhibition for UNICEF, to help children all over the world in need of support, water, food, medical care and education. The essence of a great project is that it gathers a life and direction of its own, and it has a structure that dictates the content and gives the photographer a framework around which to build a set of pictures that ultimately sit together to tell a complete story. For Rory Lewis the spark that set everything in motion was a desire to celebrate the vast body of talented individuals from all walks of life who happen to have strong connections with Scotland and the North of England. From that single initial thought everything else just followed and fell into place, and the momentum ultimately became unstoppable until the target list of those who were to be featured had climbed to the extraordinary level. So many photographers over time have discovered that the key to working in the area where their true interest lies is to present work of that kind in their portfolio, to demonstrate their skill and to attract clients with requirements in that area. Rory’s goal as a photographer was to produce thought provoking portraiture of famous actors, models, and prominent celebrities, while the reality was, as so many hard working photographers offering a general service tend to discover, that the work coming through the door covered everything from cans of tuna, through to industrial fridge freezers and aspiring models and actors. “As I turned 31 I felt that the clock was ticking, and I felt the urge to push harder and harder to get to where I wanted to be,” he says. “If I was to achieve my goal I needed to produce a body of work that was unequivocally what I wanted to do, and this would help me to attract the attention of magazine editors and photography agents. Northerners Exhibition Poster (Sir Patrick Stewart, David Warner.) Rory Lewis Photographer 2014. Building the collection With a famous name behind him Rory approached other celebrities with renewed confidence, but he still needed to fight for the sittings he was after. “Patrick Stewart and Sir Ian McKellen were performing at the Cort Theatre in NYC,” he says, “and I wrote to them both and the answer was no. I then wrote a further letter explaining it wouldn’t take long and it would mean a great deal to UNICEF and the exhibition. To my surprise they both emailed me back accepting the invitation, and from then on I’ve been able to send example images to other celebrities and prominent northerners. Because of the nature of the subjects every photo shoot has been different, and each has brought its own set of challenges, ranging from lighting decisions through to the small matter of coming to terms with directing a person who might have legendary status. 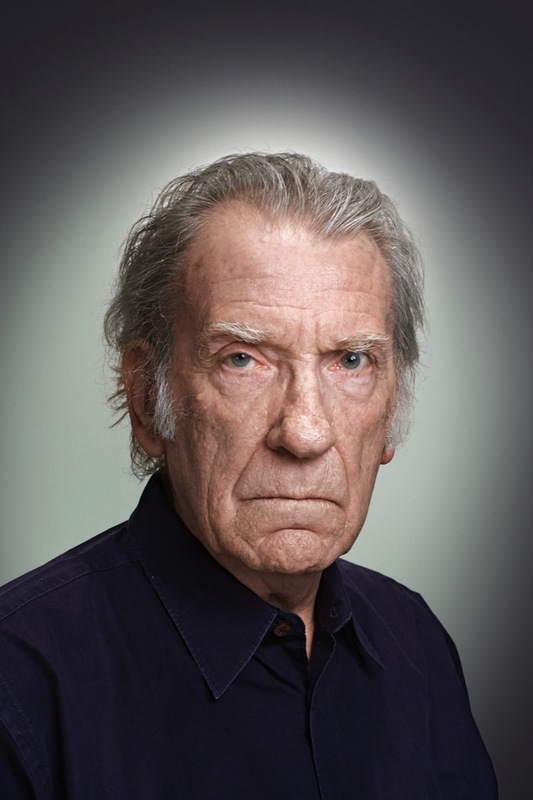 “Imagine for a moment, having one hour to direct an actor with the talent of Sir Ian McKellen with no brief, simply photographing the personality, getting to know the real Ian not the characters he plays, and directing him to convey emotions and expressions.